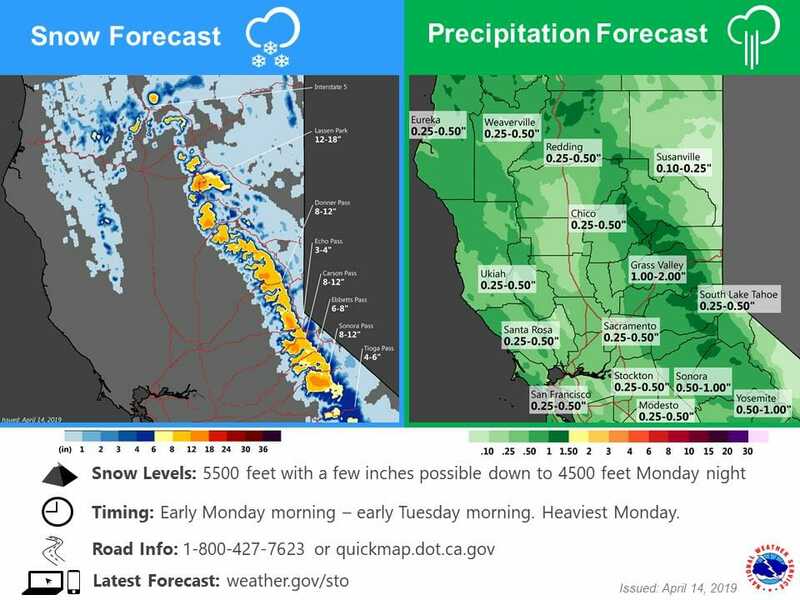 April 15, 2019 – Showers spread south across the region today and continue into early Tuesday. Travel impacts likely through the higher passes. Dry and warmer conditions return by the middle of the week. Satellite imagery indicates partly to mostly cloudy skies across NorCal early this morning as the initial frontal system that brought light showers to the far northern Sierra yesterday has moved south into central California. The stronger upstream system is crossing 130W with precipitation just offshore northwest California. High-res ensemble (HRRR and HREF) still indicating a more robust system, compared to recent ones, moving into NorCal today and tonight. Precipitation is expected to spread across the northwestern half of the forecast area this morning, and then southward across the remainder of the region during the afternoon. Light to moderate precipitation is forecast as the front moves south through this evening tapping TPW plume of around an inch. QPF has been boosted a bit and generally ranges from 1/4 to 1/2 inch in the valley with 3/4 to 1.5 inches over the foothills and mountains. 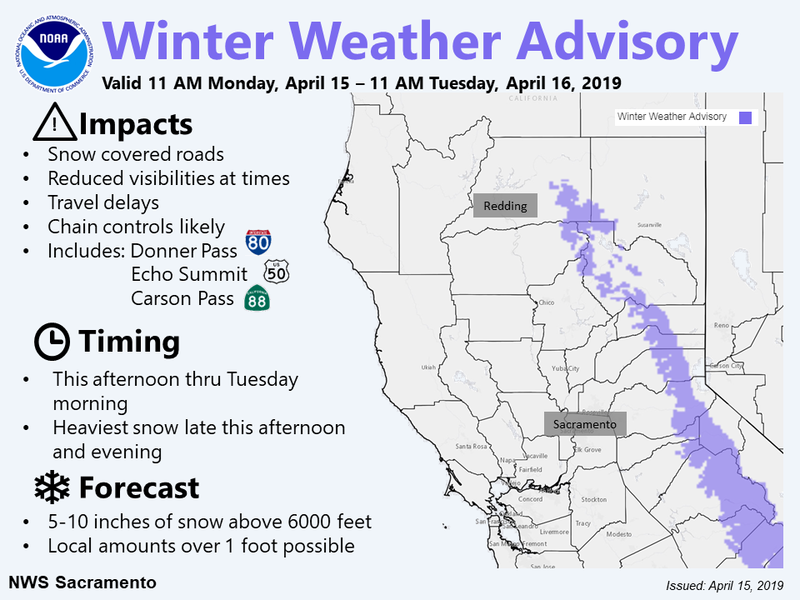 Winter weather advisory remains in effect for this afternoon into Tuesday morning across the southern Cascade Range and northern Sierra Nevada. 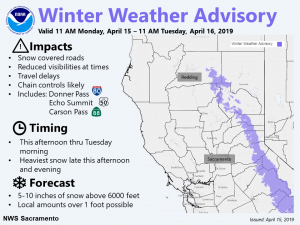 A few inches of snowfall accumulation can be expected at around the 5000 foot level with around 8-12 inches over the higher elevations and along the crest. The period likely to see the highest potential for travel impacts will be late this afternoon and overnight tonight. System moves east Tuesday with lingering showers over the mountains mostly ending in the morning. Skies will clear out in the valley with milder temperatures returning. Ridge builds in bringing dramatically warmer temperatures for Wednesday and Thursday as highs across the Central Valley climb into the lower to mid 80s (around 10-15 degrees above average on Thursday). By Friday, mid-level ridging will be breaking down over northern California as a shortwave moves across the Pacific Northwest. There will be a chance for some precipitation mainly over the northern mountains Friday evening, with chances spreading southward across the Sierra-Cascade mountains and foothills Saturday and Sunday. 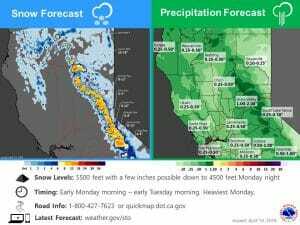 For now, snow levels look to above pass levels and minimal impacts are expected.